My name is Eva Lantz and I am the owner of Kennel Silogårdens. I breed Beaucerons in a small scale in home environment; all my dogs live in the house with me. My animals are part of my family and as such they are always close to me. I have had the breed since 2002 when I got my first puppy, 9 weeks old. Silo instantly took a place in my heart! I chose my kennel name since Silo is the body in my breeding and he was my first beauceron. Since then I have had TaDiva, who moved in with us at an age of 1.5 years, unfortunately she got killed by a car just before her 4th birthday. Scylla, who is Silos sister, moved in with us when she was 5 years and I also have Axi who is Silos daughter, imported from Germany. The pack was expanded with Axis son Figo in December 2010, he is my second puppy since all the other dogs have been adults or young adults when moving in with me. Read more about my dogs on their own pages. The pack also consists of 3 cats. My puppies are born in my living room since it is the warmest room in my house. They stay in the puppy crate until they are 3-4 weeks, then they get a larger space. I find it important for the development of the puppies that they get to experience as much as possible during their first 8 weeks in life. I take them outside as soon as the weather permits and the can explore the garden (which is part forest plot) and I also have some obstacles that they can spend time on. We take exploration walks in the forest, on and off leash. All puppies has experienced walking on a leash when they leave for their new homes. I take them for car rides as much as possible, take short walks in the city and in general let them experience a lot of different environments. They should have seen as much as possible and walked on as many different surfaces as possible when they move to their new homes. I teach them the meaning of a clicker very early and I do some eye contact training, they catch on very quickly! It is so much fun training these young puppies! I try to get them house broken or at least I start that training. I also do a ”puppy test” when they are 7 weeks, after that I decide which puppy will be your new friend. Because of this it is important for me to know your plans for your new dog so you can get the ”right” one. WHAT IS INCLUDED WHEN YOU BUY A SILOGÅRDEN PUPPY? I am at your disposal for questions and help 24/7. You are always welcome to stop by for coffee, dog training, help etc. My puppies must have a good and active life, this is most important to me! A dog from Silogårdens should train and preferably compete, it is a priority for me! Not everybody has to compete with their beauceron but to have a good life the dog must have an active life. I breed individuals who have good working capabilities and they will not be very well suited to be ”couch dogs”. A beauceron is not bred to be only a companion dog or couch dog – it is a working breed! They want to and demand to work! 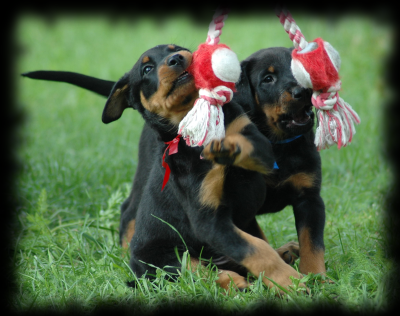 It is vital that one knows this before purchasing a beauceron. If you are a first time dog owner or have no experience with dog training I will help as much as I can! It is not cheap to own a dog, this is also vital to know BEFORE becoming a dog owner. The puppy must have good dog food the first year, I recommend EUKANUBA which is a good food for a beauceron. I want the puppy to have this during its first year. I want you to do MH (mental description) and x-ray your dogs. I want you to come to the training weekends I arrange, we will train both obedience, tracking and other things and I will help you with whatever you feel you need help with. I am always available 24/7 for help and questions! I want a good connection with my puppy buyers so I can observe the development of the puppies. I prefer if you show your dogs at dog shows because it is a very good environment training and it’s also fun to have an acknowledgement of the dogs physiology. This is however not something I demand! The dog should, before 4 years age, participate in a Mental test ”Korning”. If you are interested in the breed, please give me a call or send an e-mail. You are very welcome to visit and meet my dogs ”live” to form your own opinion of the breed and my breeding. Before you can reserve a puppy I want to meet you and I want you to meet my dogs.